On her favorite dish to cook and her go-to egg roll ingredients. 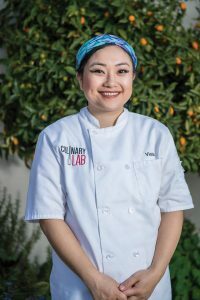 Viola Vue, a first-generation American of Hmong descent, is the kitchen manager at CulinaryLab School in Tustin. She lives with her husband and family in Costa Mesa. Everyone gets caught up with their busy lives, but having a meal together allows time to sit down, relax, and grow as a family. Cooking should be fun, not a chore. When we get a chance to make egg rolls, we make a whole day of it—rolling, frying, and eating them. Ground pork, cabbage, carrots, wood ear mushrooms, bean thread vermicelli, cilantro, and my not-so-secret ingredient, cheese.